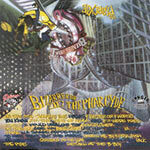 The Pharcyde's 1992 album, Bizarre Ride II The Pharcyde, has been heralded as a hip-hop classic by just about everyone - but you knew that. Bolstered by the lush, and jazzy production of J-Swift, and the hyperactive, and comedic lyrics, the album helped to usher in a new era of alternative hip-hop. To coincide with the upcoming 20th anniversary of this landmark album, Delicious Vinyl is going completely old school with this special edition cassette release. This tape contains the entire Bizarre Ride album reissued on a nostalgic blue tinted cassette, and is only available as a limited release. Be sure not to miss this classic release, in a truly classic format!